Strong Bad and friends have been entertaining the internet for over eight years now, combining colorful characters and pop culture reference to create one of the web's rare clean destinations for comedic entertainment. 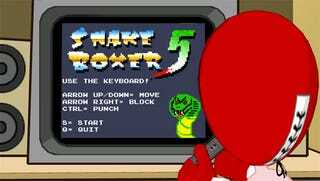 As regular visitors to Homestarrunner.com know, video games have played a large part in the series over the year, to the point where they even created a fictional video game developer, Videlectrix ("We use computers...to make video games"), to handle their vast catalog of titles. Now the Brothers Chap have teamed up with Telltale Games to deliver the first "proper" Homestar Runner video game in the form of Strong Bad's Cool Game for Attractive People, an episodic adventure game for the Wii and PC. The long-awaited first episode "Homestar Ruiner" is now available, and we checked it out to see if it passes muster or deserves to be DELETED!Loved: The Humor: Now I've been following Strong Bad at the Homestarrunner.com website for years now, so the humor is right up my alley. The game almost feels like one long, extended Easter egg from a Strong Bad email. The Graphics: Strong Bad, Homestar, and crew are rendered lovingly in 3D, staying true to their 2D roots despite the extra added dimension. Just about every character in the main HSR universe is represented, including my favorite, the drive-thru whale (sever your leg please). Mini-Games: The Videlectrix classic Snake Boxer 5 is even more entertaining when you realize that it is exactly the sort of simplistic game we'd play for hours back in the Atari days, while the Teen Girl Squad mini-game is a delight for anyone who's ever killed stick figures in a spiral notebook. Game Mechanics: SBCGAP is a relatively simple point and click adventure, with a few little tweaks to keep the game flowing. Might have been tedious if not for the ability to warp anywhere on your map at any given time. Music: Homestarrunner.com fans expect music, and the opening and closing theme song to the first episode does not disappoint. "You Can't Handle My Style" is sure to become an instant classic. There's also a boom box located in Strong Bad's kitchen that lets you access a selection of typical Strongbadia musical fare. Hated Standard Adventure-Game Tedium: SBCGAP is a standard point-and click adventure game, so the standard point and click adventure game tedium applies. Click, wait for character to get into position, only to tell you that you can't interact with the object the way you intended. More of a pet peeve, but if an adventure game is going to tell me "No" I'd rather it be up front about it. Strong Bad's Cool Game for Attractive People is very much a game for fans of the series. Without knowing these characters and not having experienced their interactions in the past, I can easily see some folks just not getting it. If you're unfamiliar with the whole Homestar Runner universe, I suggest heading over to the website and hitting the R button to pull up a few random toons. If you enjoy the humor there, you'll enjoy the game. Homestar Ruiner is an excellent start to Telltale's Strong Bad saga, offering fans of the series a chance to break out of the email window and explore Strongbadia and surroundings in an all-new way. Strong Bad's Cool Game for Attractive People Episode One: Homestar Ruiner was developed by and published by Telltale Games. Released on August 11th on WiiWare and PC. WiiWare version costs 1,000 Wii Points. PC version costs $8.95 for single episode, $34.95 for a subscription to all five. Played PC version to completion.